The Just Between Friends Kid’s Consignment Sales Event is Thursday, March 19th through Saturday, March 21st, at Gold Creek Church in Mill Creek. Photo courtesy of Just Between Friends. From a Just Between Friends press release. Local moms are getting involved in recycling their children’s items at the Just Between Friends Consignment Sales Event. Vibrant colors and playful patterns will soon be seen on clothing racks across the country, including in Mill Creek, Washington, at the upcoming Just Between Friends Sale. These fresh, spring-beckoning fashions will be accompanied by snappy rain boots and fun hats that will make you smile just to see the neighborhood kids wearing them. However, it’s the prices on these items that are thrilling parents across the county and thousands of moms in Western Washington! 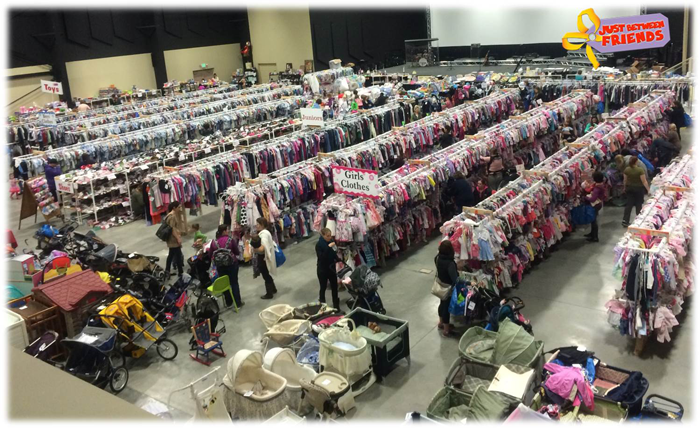 The semi-annual Just Between Friends (JBF) Kid’s Consignment Sales Event is scheduled for Thursday, March 19th, through Saturday, March 21st, at the Gold Creek Church in Mill Creek. “We’re excited to bring Just Between Friends again to this community, where we can offer area moms the opportunity to participate in and shop our event in preparation for the Spring and Summer months ahead,” said Heidi Esola, event coordinator of the Just Between Friends Lynnwood children’s consignment events. “At this time of year, moms are looking for creative ways to earn money for upcoming vacations. This sale provides them a fun, easy and proven way to help them do just that as they will make a percentage of what their items sell for, and they can shop the sale before the doors are even open to the public,” says Esola. Volunteers, who help run every aspect of the event, shop before everyone else and even make a higher percentage for the items they sell. In addition to quality clothing (children 0 to Junior along with Maternity), you also can expect to find outdoor playground equipment, movies, toys for all ages, games, books, strollers, nursery equipment/furniture and countless other items at the upcoming sale representing brand names such as: Gymboree, Little Tikes, Step One, Fisher Price and Leap Frog. There is also a new “Mommy and Daddy Mart” offering unique items since parents need to treat themselves sometimes. At the end of the sale, the inventory of donated items left unsold will be handed over to a few different non-profit organizations, such as Next Step Pregnancy Services, Kids Kloset and Northwest Baby Corner. Shoppers are welcome to come out and experience the event to see what treasures they will find. The event will be open to the public beginning Thursday, March 19th, at 12 noon and ends on Saturday, March 21st, at 1:30 pm. However, if you are a new or expecting mom, military family or a teacher, there is an exclusive PreSale allowing you to shop before the sale. For PreSale information along with a detailed schedule of the event, click here. For more details and to sign up on the mailing list visit our webpage: www.lynnwood.jbfsale.com. Don’t forget to follow us on Facebook: Just Between Friends of Lynnwood. LOVE the JBF sale..... this one in Mill Creek is one of the best! !